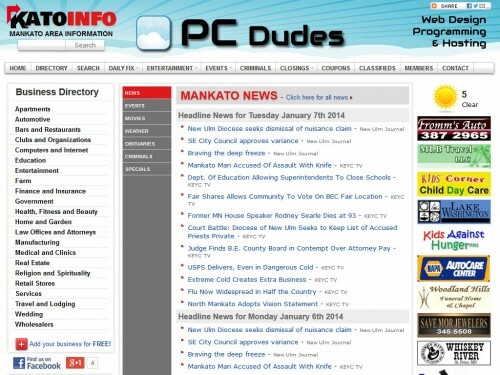 KatoInfo.com is a local information directory for the city of Mankato Minnesota and the surrounding communities. KatoInfo is our answer to the larger city directories often run by companies with no real knowledge of the area or vested interest in the community. KatoInfo functions as a content management and advertising platform as well as providing free business information listings and other information such as local movie times, local events, obituaries, classifieds, and weather. KatoInfo offers many advertising solutions ideal for businesses with the Mankato area and has some of the best rankings in the major search engines when looking for local businesses. For more information on KatoInfo click here.